If there is such a thing as "peak IPA," it hasn't happened yet. Crooked Goat, a microbrewery and tap room that opened in Sebastopol's Barlow last August, already has plans to open a second tap room in March. 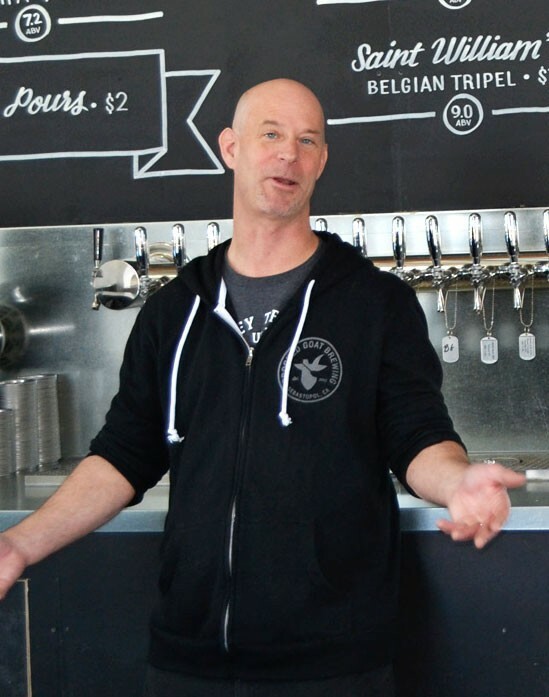 Located on the opposite end of the unit, with the brewing facility in the middle, the new space will have more lounging options, according to head brewer Will Erickson (pictured), in contrast to the spartan, metal-shop setup of the current bar. While showing the plans for the new space amid the dust of construction, Erickson explains why he thinks craft-beer boom part two is different: in the gold rush of the microbrew boom of the 1990s, it was enough just to get beer in the taps—but sometimes the quality wasn't there. "People realize you've got to have quality," he says about today's brewers in an ever-more competitive market. "Otherwise, you're going to get decimated." You've also got to have hops, and lots of 'em. Drawing on his 20 years of professional brewing experience, most recently at Jack's Brewing of Fremont, Erickson is making sure that Crooked Goat won't be left holding the grain bag. The brewery started when he helped his brother and some friends with a garage homebrew project. The beers won awards, and the group chipped in to go pro. The flagship Ibex IPA has the sweet smell of fresh grain but the dry taste of West Coast–style ale—the house style here at Crooked Goat, where you'll find no barrels, yet, and no funky sours. Fruit infusions, yes—fruity beers that aren't seen as, well, too fruity are another phenomenon of today's craft beer, says Erickson. Just 10 years ago, when he was at Mammoth Brewing, a buddy who'd come up from San Diego to hit the slopes mentioned a grapefruit IPA they were making down there. "Grapefruit in an IPA?" Erickson remembers thinking. "Dude, what are you smoking?" A spritz of citrus spices up the creamy, nitrogen-infused Grapefruit Mountain Goat IPA and the otherwise dry, earthy Grain & Blood mandarin orange double IPA. The juicy, bright pink First Crush raspberry wheat ale smacks of fresh fruit lemonade. And then there's Bazooka Joe, which is brewed with—why not? Crooked Goat beers are not distributed, but can sometimes be found farther afield. This week, Santa Rosa's La Vera Pizza hosts a Crooked Goat "tap takeover" through Feb. 12. At the tap room, pizza can be ordered in and delivered by the brewery's Barlow-roaming golf cart. Try the chèvre. Crooked Goat Brewing, 120 Morris St. #120, Sebastopol. Open Monday–Thursday, noon–9pm; Friday–Saturday, noon–10pm; Sunday, noon–8pm. 707.835.4256.